With some help from a friend, Carl Lehman (he did the heavy code lifting), I have developed a simple tool, the reSearch Engine, that allows a user to enter a keyword or topic, press ‘enter’, and receive a set of links to search databases accordingly. For example, say you are doing research on memory theory and the Gospels. 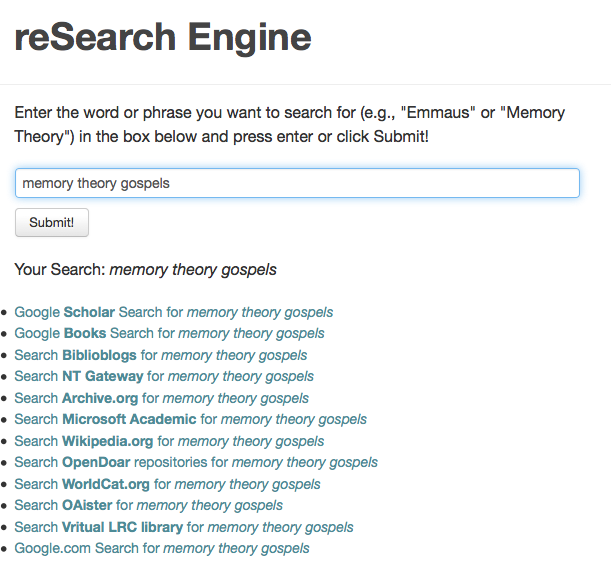 Simply type memory theory gospels into the search bar, press ‘enter’, and you will receive a list of links that will take you to the relevant searches in Google Scholar, Google Books, Microsoft Academic, and some key databases. I need your help. Are there databases or search engines you use that I have not included (I have left out subscription-based databases purposefully)? Leave a comment and let me know what you like or don’t like about it, as well as if you find any bugs. Feel free to invite others to try it. Find it here: reSearch Engine. I especially find these sorts of searches useful for running a ‘quick scan’ on this or that topic to ensure I have not missed something otherwise. About 5 minutes into using your new ‘combination’ search engine I found a book to buy: “Performing the Gospel: Orality, Memory, and Mark” (via google books). Nice. And thank you. By the way, Any chance you could put a link to it on the right side of your blog? … I’d probably come here to use it. Sounds great. I have link in the nav bar (at top of page), and I’ll probably add something in the sidebar, too. Thanks for the suggestion! Very simple and very useful. For someone like myself now far from a theological library, this is great. Glad you find it both simple and useful!